We are no longer boarding dogs. Rise and shine sunshine! The day gets started early with a 1/2 mile morning walk and breakfast. Each dog gets one on one attention during their walk. The walks are a special time when Happy Tails’ employees really get to know you’re dog and see their individual personality. Science Diet is Happy Tails’ choice dog food, but if you’re dog has a more tempered pallet feel free to bring in his favorite dog food and treats. Happy Tails’ staff will also make sure that your dog receives whatever medication he needs throughout the day. Please make sure to indicate the dosage and frequency on his check in sheet. Depending on the weather, afternoon playtime allows your dog the opportunity to play with other dogs during the day. This is also an opportunity for special attention and love from Happy Tails’ Staff. Wow, what a day! 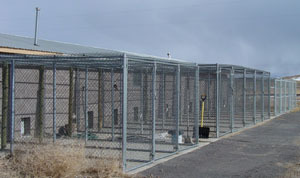 Each kennel has both an inside and outside area. 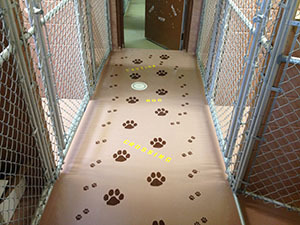 If the weather is nice dogs are allowed to move in and out as they please during the time they're in the kennel. But after dinner it's time for lights out. All dogs are shut in for the night around 9:30pm.